Tavern Puzzles® are reproductions of a type of puzzle traditionally forged by blacksmiths to amuse their friends at country taverns and inns. Keeping with tradition, a museum-trained blacksmith from Long Island has reproduced some of these antique designs as well as his own original designs. All the puzzles are handcrafted and individually assembled. 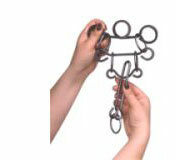 Each puzzle is mechanical in nature; removal of the object piece does not rely on force or trickery. © 2019 Tucker-Jones House, Inc. All rights reserved.